As the relationship between soils and landscape within the context of soil formation is well known, predictive relationships between soils and soil formation factors can be established by regression techniques, relating soil and terrain attributes to occurrence of soil classes. This study proposes the production of maps using logistic regression on soil and terrain information from a pilot area to reproduce the original map and predict soil distribution in other similar landscapes in three study areas (Ibibubá Municipality, Sentinela do Sul Municipality, and Arroio Portão Watershed) in map scales from 1:30,000 to 1:50,000 and located in three ecological regions in Southern Brazil (Planalto, Encosta da Serra do Sudeste, and Depressão Central, respectively). By using logistic regressions for digital soil mapping, the method predicts the occurrence of soil units based on reference soil maps (produced by conventional methods), and on several parameters derived from a USGS SDTS-SRTM DEM, namely slope gradient, profile curvature, planar curvature, curvature, flow direction, flow accumulation, flow length, Stream Power Index (SPI), and Topographic Wetness Index (TWI). 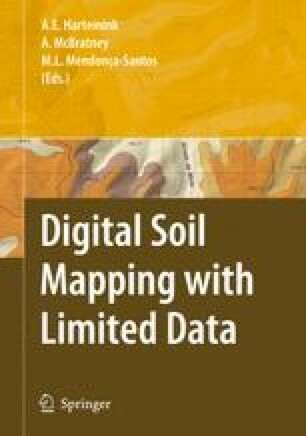 Results show that parameters such as elevation, curvature, SPI, TWI, and distance to streams are more frequently selected as parameters for predicting the occurrence of soil classes, with overall percent correct from 61% to 71%, and Kappa Index from 36% to 54% when the maps produced are compared with the original soil maps with a simplified legend (which simulate the production of soil maps with smaller scales that the original soil map). The prediction of soil map units using logistic regressions generated reliable soil maps, and the method appears to deserve more research effort, given the reliability and low cost of the resulting information.